Loud noises like fireworks are one of the top reasons pets go missing, so secure your pet in an escape-proof place. If your pet does go missing, download the ASPCA app for a free step-by-step digital toolkit to help find your pet: www.ASPCAapp.org. High summer temperatures and bright days can mean dehydration, overheating, and scorched paws. 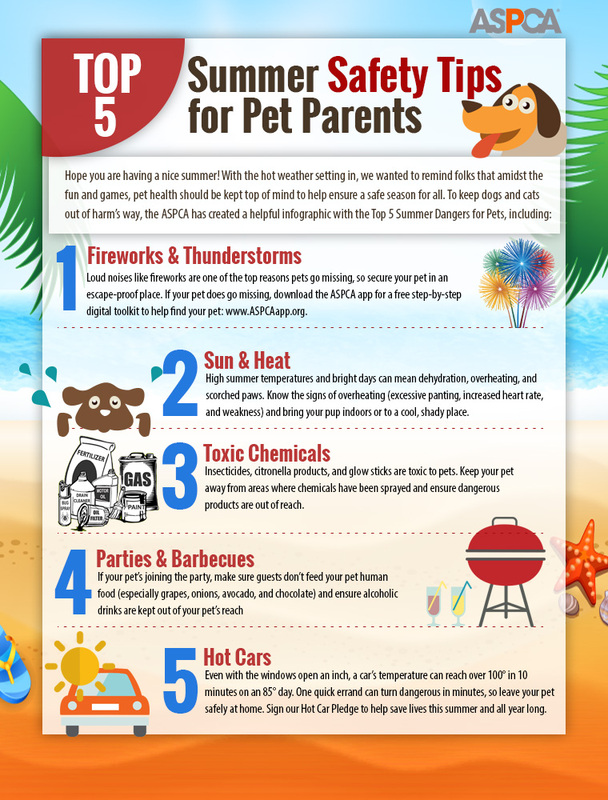 Know the signs of overheating (excessive panting, increased heart rate, and weakness) and bring your pup indoors or to a cool, shady place. Insecticides, citronella products, and glow sticks are toxic to pets. Keep your pet away from areas where chemicals have been sprayed and ensure dangerous products are out of reach. If your pet’s joining the party, make sure guests don’t feed your pet human food (especially grapes, onions, avocado, and chocolate) and ensure alcoholic drinks are kept out of your pet’s reach. Even with the windows open an inch, a car’s temperature can reach over 100° in 10 minutes on an 85° day. One quick errand can turn dangerous in minutes, so leave your pet safely at home. Sign our Hot Car Pledge to help save lives this summer and all year long. For another great resource on pet safety, check out this comprehensive resource from Expertise.